Before we go any further, we will address the correct pronunciation of the name of our art and some brief history. The word Ryukyu is pronounced as “roo-queue” (think of kangaroos standing in a row!) and is the historical name of the chain of islands which were annexed by the Satsuma clan of Japan, and of which Okinawa is the largest island. The word Kempo is pronounced as it reads, “kem-poe,” and is a Japanese translation of the Chinese words chuan fa, the common translation of which is “fist law” or “fist method.” The more accurate translation of Kempo is “rolling hand method” which at a simple level refers to the way the fingers and thumb roll into the palm to create a fist and at a deeper level refers to the rolling and snaking motion of the hands and arms when applying tuite (pronounced “tui-tay”) techniques. Therefore, in studying the art of Ryukyu Kempo, we are learning the “Ryukyu fist law” or “Ryukyu rolling hands method.” Ryukyu Kempo pre-dates most forms of karate whether they are of Okinawan or Japanese origin. Another word we must understand is karate. Karate is correctly pronounced as “kah-rah-teh” not “ka-raw-tee.” Its most common translation is “empty hand,” which refers to the empty hand techniques which form the basis of all karate. There is however, a deeper level of meaning in the translation “empty hands” which takes the understanding of “empty” further. We understand “empty” to mean limitless, void or undefined, meaning that our hand techniques are not bound by any rules or limits – our techniques are limitless. Allan Amor Kaicho explaining the meaning of kempo, rolling hand. Ryukyu Kempo Karate was introduced to the world through the efforts of Taika Seiyu Oyata and his early students. One such student was Allan Amor, who after studying for many years with Mr. Oyata, founded the United Ryukyu Kempo Alliance. The United Ryukyu Kempo Alliance currently has schools in the United States, New Zealand, the United Kingdom, Canada and Finland. The United Ryukyu Kempo Alliance and its members do not discriminate against any other martial art. All systems have their benefits and are appealing to certain individuals. When a martial art is studied fully and completely, the same underlying truths become apparent. 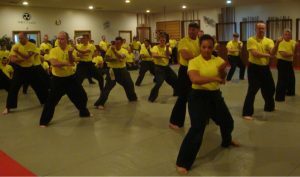 There are only so many ways to move the human body and virtually every martial art contains similar motions, taught in a different order and with a different emphasis. Ryukyu Kempo karate is based around the study of kata (forms), bunkai (applications) and Ryukyu Kobudo (traditional weapons). When combined with training drills, our forms, applications and weapons skills combine into an effective, congruent and complete form of life protection. Ryukyu Kempo of the U.R.K.A. is one of the only martial arts available today which is taught in a true A-to-Z fashion where every step builds on from the last and leads on to the next in a time-proven, purposefully constructed curriculum.